I really ended up loving this movie, to the point where I think I would rank it among my all-time favorite Marvel movies, which is honestly a little harder to determine than you’d think! Seeing Randall from This is Us as King T’Chaka’s brother was a bit of a surprise! Having T’Challa’s sister in the Q from James Bond role was a little odd at first, but by the end surprisingly satisfying. And lastly, I ended up liking Agent Ross a lot more by the end of this movie … because I don’t know about you, but I really hated him by the end of Civil War. 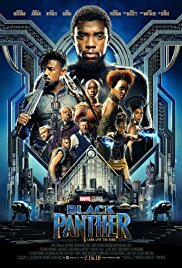 It was kind of funny because I knew going into this movie that there were somehow multiple Black Panthers because I had seen a photo of the Erik Killmonger Funko Pop where he’s wearing the gold bedazzled panther suit and I was pretty sure that Killmonger wasn’t the name of the good version! …remind you of any wall-loving presidential figure in particular??? I wasn’t sure where this one was going to fall and we ended up going to see it very much on a whim when my visiting sister-in-law offered to stay home after the kids went to bed so we could sneak out – it ended up being a very well done film with plenty of emotion, rich characters who put a new spin on the usual agents and soldiers that we typically see in superhero movies, and I think it did a great job of filling us in on the backstory for Black Panther so we’ve got a little more to go by next month when we see him and the rest of the gang team up against Thanos in Infinity War! Granted, that’s one thing I would’ve liked to see – even if just in the end credits scene – was another teaser for Infinity War, aside from the quick vignette with Bucky. I was kind of disappointed that the actual trailer didn’t run before this movie because we seemed to get lots of other great superhero and generic action movies in the mix.